Here at Wilston Vet we strive to offer our patients, your pets, the highest quality of veterinary care available whilst treating them with the compassion and respect they deserve. Your furry friend will benefit from our state of the art equipment as well as enjoy the quality care from a team of highly trained professionals. We have in-house blood analysis machines, microscopes, ECG, a digital x-ray machine, an ultrasonic dental scaler and polisher, a digital dental x-ray machine, comprehensive anaesthetic monitoring devices, blood pressure machines, a tonometer and intravenous infusion pumps. We have a dedicated cat hospital ward so our feline friends do not become unduly stressed by their canine counterparts! Our surgery is fully computerised enabling your pets’ records to be accessed at the touch of a button. Your sick or injured pet will feel safe and comfortable with us. 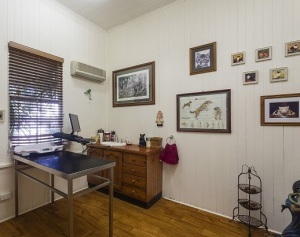 Our consultation rooms are clean and welcoming. Your pet will not feel like the room is a typical “hospital” type of room, but more like a room in their own home. We also go to great efforts to avoid the waiting room, consult rooms and treatment rooms smelling like a hospital. The scent of an aromatherapy oil burner wafts through the surgery as well as calming pheremones from “Feliway” diffusers to put your pet at ease. Our dedicated surgical theatre is sterile and well equipped with the latest anaesthetic monitoring devices to ensure that your pet is kept safe during its surgery. An experienced veterinary nurse monitors every anaesthetic and your pet is never left unattended. If your pet requires x-rays, we now provide a digital x-ray service, which allows us to x-ray your pet very quickly and effectively making for much shorter aneasthetic times. Not only this, but it is much more environmentally friendly as there is no hazardous chemical waste. 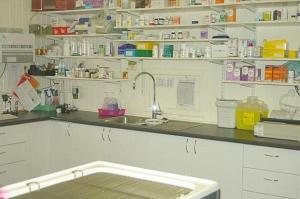 We have a fully equipped pharmacy with all the latest drugs available to treat your pet. Your pet is kept stress free during their stay in our clean, comfy air-conditioned hospitalisation kennels. There is a separate ward for both dogs and cats. Following surgery your pet is observed in a warmed comfortable bed. One of our experienced nurses stays with your pet whilst they are waking up to ensure they have a smooth recovery. Our spacious cattery is very popular. There is oodles of room to run and jump and it is cool, light and airy. Our Royal suite is very popular. See our section on Cattery for all the details. Wilston Vet services all inner Brisbane suburbs including Wilston, Windsor, Grange, Lutwyche, Herston, Spring Hill, Kelvin Grove, Newmarket, Teneriffe, The Valley, Gordon Park, Wooloowin, Clayfield and Kalinga. We also have many clients who come from across the river to see us or from the Western Brisbane suburbs as we are conveniently located close to the Inner City Bypass exit as well as the Clem 7 Tunnel.